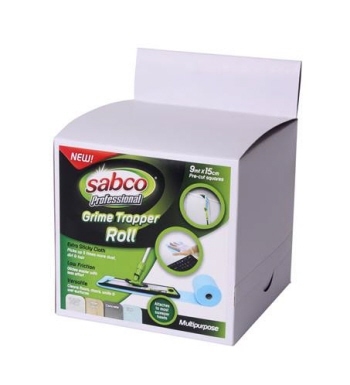 Sabco Grime Trapper is special sticky pad to trap dirt instead of simply sweeping dust. This disposable pad is made from polyester and has a special adhesion treatment which helps to pick up to 5 times more than traditional dusting cloths or mops. 9M each roll with slight perforations each 15cm. It can be used as long or as short as required by hand, can place on high dusting frames or flat mops if required. It is ideal for use on furniture. This pad can pick up 5 times more dust, dirt and hair than traditional dusting cloths. Lower friction for better glide and reduced need for force. Use the GRIME TRAPPER for dusting surfaces and furniture instead of common dusting cloth. Choose one or more sheets according to your needs. Dust will remain trapped into the pad and won’t fall apart. Use the GRIME TRAPPER to dust any type of floor instead of using common oil impregnated cloths or floor dusting cloths. 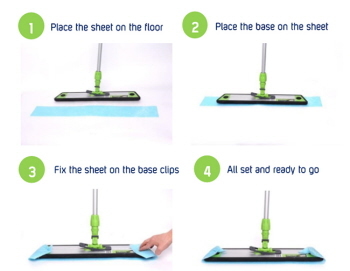 Choose the length of the pad according to your dusting base; fix the pad on the base clips and dust the floor. The Grime Trapper can be used both sides. It will make it easier to collect hairs and the finest dust & mite and tick, that usually are not trapped. 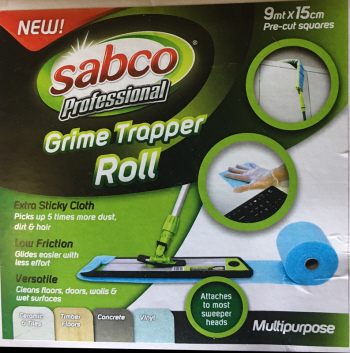 The Grime Trapper Roll is designed for effortless dusting. Ideal for the Healthcare, Hospitality and General Cleaning environments. Vertical cleaning. Choose one or more sheets according to your need. Fold the pad to your duster and stick it to itself. Surface cleaninig. Choose one or more sheets according to your needs. Dust the surfaces and furniture, wearing gloves. Floor cleaning. Choose the length of the pad according to your dusting base. 1. Place the sheet on the floor. 2. Place the base on the sheet. 3. Fix the sheet on the base clips. 4. Start from the edges and move backwards in an S movement to avoid walking on cleaned surfaces. Remove the disposable cloth and throw in the garbage bag after use. Replace the pad when it is needed.